GUYS: Do you have Bakugan brawlers all over your house? Because I do. They're stuck to my fridge, they're hiding in my bedroom, and they are dearly loved by the boys in my house. They were also the inspiration for our latest printable set! 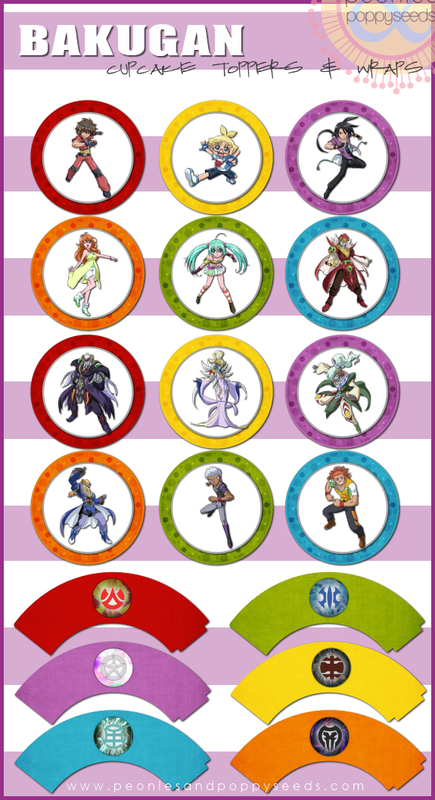 This Bakugan cupcake printable set features 12 different characters from the Bakugan universe, and the cupcake wrappers feature the six Bakugan worlds. Enjoy this free download by clicking here, or by clicking the image above! Peonies and Poppyseeds printables are free for Personal, Private, Non-Commercial Use Only!